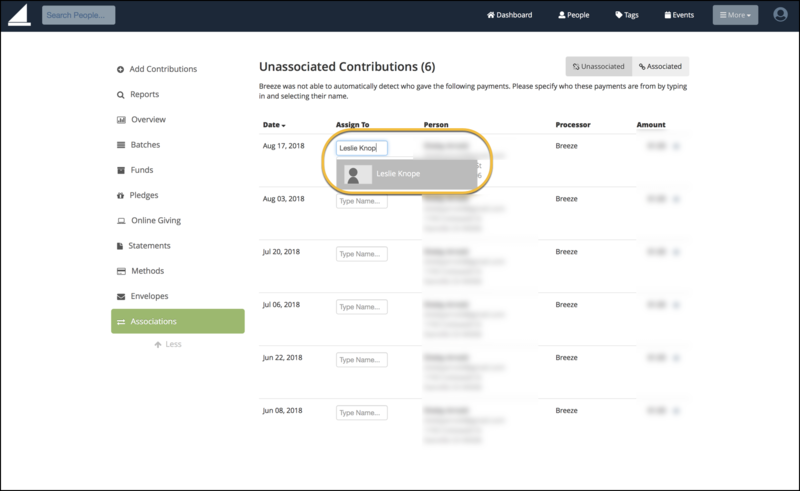 When someone gives to your organization through your online giving page, a third party integration, or a form payment, Breeze will attempt to match up that payment with an individual in your database.1 If unable to find a match, Breeze will place the contribution in a list of unassigned contributions for you to manually assign. Navigate to "More > Contributions." Click "Associations" on the left (after clicking "More"). Type the name of the person in the box and select them from the drop-down list. Type the name of the person in the box. If the person is not found click "+Person Not Found - Click to Add"
This will bring up the "add person" box where you can add any details you'd like/have on that individual.  It will auto-populate with their name, email, and address based on the information that they entered at the time of contribution. If Breeze associates a giver incorrectly, how can I correct that? Hey there - When you go to More > Contributions > Associations you'll see a button int the top right corner of "unassociated" and "associated". Click on "associated" and then click the little "x" next to the person who is incorrectly associated. Then you can go back to "unassociated" and re-connect them with the correct individual. I made a test payment. The payment shows in history but does not show in the associated or the unassociated tabs. How do I associate it? It does not show in my contribution history, only in the online giving history...just to clarify. I just took a look at your account and it appears that the record of the contribution was deleted which is why it's not showing up to be associated or in the contribution history page. To fix this, you can go to More > Account Settings > Restore and then restore that test gift that you made by clicking "Undo" next to the gift. If you'd like further instruction on this, we'd love to assist you with that. Please Contact our Support Team and we'll walk you through all the steps. I have to keep associating gifts with people manually even though they have recurring giving set up and those schedules are linked to their Breeze profiles. Would there be some reason why Breeze wouldn't be automatically associating these gifts? I'm having to manually associate nearly every gift given online. Thanks for your help! @ryant Ideally the gift should be automatically assigning as long as it can find a matching name and email address, or a matching name and street address. I have seen many times that the giver will enter the name but put a middle initial, which requires a new association. Then the next week they give but this time they put a . after their middle initial, that will require a new association. If they put a . after the St. in their address, that will require a new association. So all that to say, as long as they enter in the information exactly how they did last time (when you made the association) it will auto associate that gift. If this seems to be a recurring issue for a donor, it may be a better option to have them create a recurring gift. That way Breeze will auto associate their gift each week automatically since the information is saved. Another option would be to update their Breeze profile to have their middle initial, or a . after St. if they keep entering it in that way. If this is something you would like to troubleshoot further please Contact our Support Team and we can dive into your database with you.